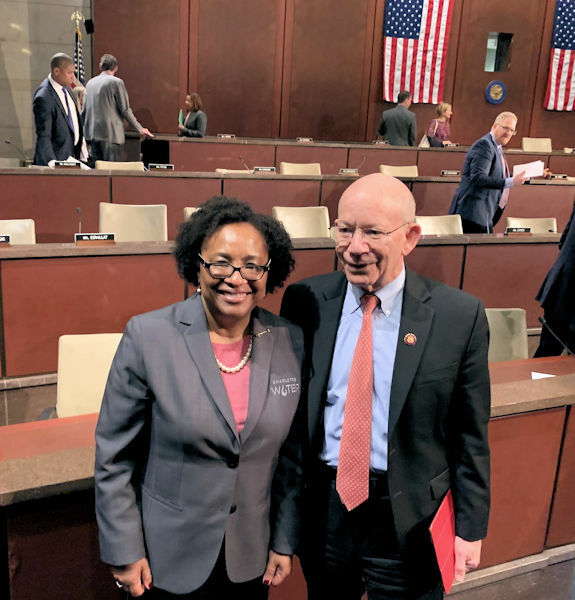 Angela Lee, director of Charlotte (N.C.) Water, stands with U.S. Rep. Peter Anthony DeFazio (D–Ore. ), ranking member of the U.S. House of Representatives Transportation and Infrastructure Committee. Water Environment Federation (WEF; Alexandria, Va.) photo/Steve Dye. On Feb. 7, Water Environment Federation (WEF; Alexandria, Va.) member Angela Lee sat before members of the U.S. Congress to discuss the water sector’s need for infrastructure funding programs. Lee attended and testified on behalf of WEF and the National Association of Clean Water Agencies (Washington, D.C.) after learning about the opportunity from WEF President-Elect Jackie Jarrell. The hearing was held after WEF joined 90 other organizations in writing a letter asking that Congress include funding and financing of drinking water, wastewater, water reuse, and stormwater infrastructure in any infrastructure package considered during the 116th Congress. “It was an opportunity to emphasize to Congress the importance of funding water infrastructure,” Lee said. “I wanted to highlight the value water [and] wastewater utilities bring to our country.” As director of Charlotte (N.C.) Water, Lee was able to speak with first-hand knowledge of that value. The public water and wastewater utility maintains more than 13,837 km (8600 mi) of water and wastewater pipes and serves more than a million customers in the city and surrounding area. Lee also has a long history of leadership with WEF as a past member of the Board of Directors and as a WEF Delegate. She also is a current member of the WEF Program Committee and the Collection Systems Committee. “Funding our extensive infrastructure is one of our greatest challenges as a utility,” Lee noted in her written testimony. Utilities experience competing pressures of meeting water regulations, balancing affordable rates for communities, reinvesting in aging infrastructure, and maintaining and upgrading treatment processes. During her testimony, Lee asked Congress to reauthorize and increase funding for the Clean Water State Revolving Fund and for projects under the Water Infrastructure Finance and Innovation Act (WIFIA). Additionally, she called on the committee to create or reestablish federal programs that aid lower-income rate payers and support stormwater management and workforce sustainability. “Without clean water, there wouldn’t be life,” Lee said. “I urge each member of this committee to reach out to your local water and wastewater utility and take a tour of our operations and learn how we are protecting your communities … and helping them prosper,” Lee said. 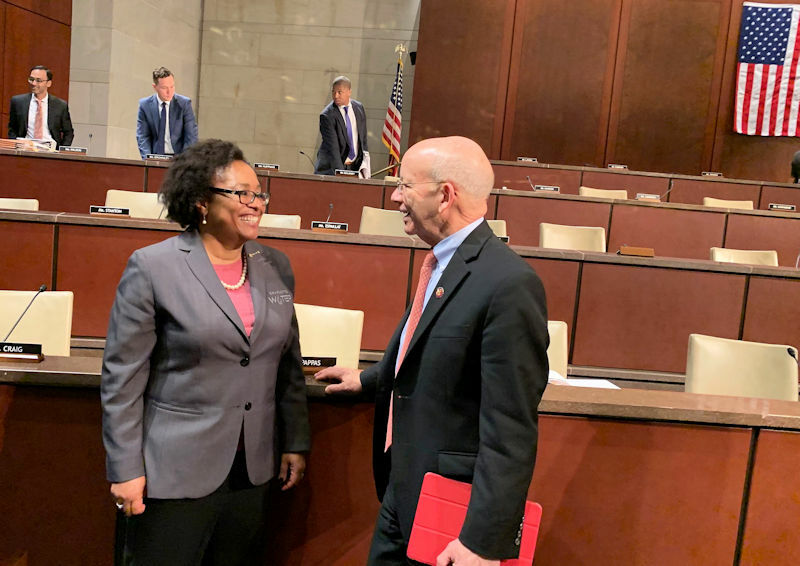 Lee talks to DeFazio after she finished giving testimony on the need to support water infrastructure funding programs in a U.S. House of Representatives Committee on Transportation and Infrastructure hearing. WEF photo/Dye. Lee explained how federal funding that supports water infrastructure has fallen from 63% in 1977 to 9% today of total capital spending. However, supporting such programs as state revolving funds and WIFIA helps utilities obtain the grants or low-interest loans needed to update aging infrastructure, Lee said. She also described how more affordable financing available for projects will help utilities lower rates for their customers. “Water is needed for human existence and is imperative for healthy communities,” Lee said. “There is nothing more valuable than clean water.” Communities thrive because water utilities operate 24 hours, 7 days a week to provide clean water. “The water heroes of this country need funding to operate and maintain the systems we are responsible for,” she said.